It can be very frustrating to take care of a vomiting child, both for parents and pediatricians. When your child is vomiting because he has strep throat or a simple stomach virus, it is easy to feel pressured to do something to keep him from getting dehydrated. Phenergan (promethazine) is one medication doctors have used for a long time for vomiting, but has received warnings. Learn about the side effects of Phenergan for children and what other options are available. Phenergan (promethazine) is an "antiemetic" used for vomiting and is available as tablets, suppositories, injectables, or syrups. Though it comes in preparations that can be used by young children, it should never be used in children less than 2 years of age, and alternatives (see below) should be considered in children over the age of 2 due to potential adverse reactions. There is not one but two major warning associated with the use of Phenergan. 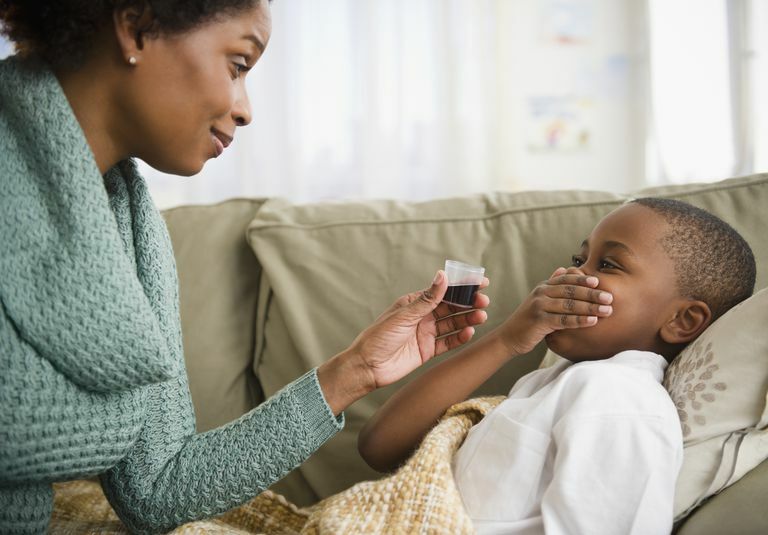 One warning particularly important for children is the risk of respiratory depression and is why the drug should never be used for children under the age of 2. In 2005 a boxed warning was added to the drug by the FDA stating that the drug is contraindicated (should absolutely not be used) in children under the age of 2 and should be used cautiously in children over the age of 2. The warning was given after respiratory depression leading to apnea (lack of breathing) and cardiac arrest occurred in several children taking the drug. In addition to respiratory depression, the use of Phenergan has been associated with agitation, hallucinations, seizures, and dystonic reactions in children. These side effects occurred at a wide variety of doses. Even if your child does not have serious respiratory depression, drowsiness related to the medication can go against your goal with vomiting. If your child is sleeping, he isn't drinking fluids and can become even more dehydrated. In 2009 another warning was given for the use of Phenergan. In this one, injections of Phenergan were associated with tissue injury, sometimes giving rise to gangrene, requiring amputation. As a parent, learning of these warnings can be terrifying, but there are alternatives available which appear to be much safer. It's hard to see your child vomiting, and dehydration can be serious, but there are many alternatives to the use of Phenergan. These include both things you can do yourself at home and different medications. Home measures can be very helpful and are recommended by the World Health Organization. If your child is becoming dehydrated, the use of medications or hospitalization for intravenous fluids should also be considered. Learn about how to determine if your child is dehydrated, and if so, how severe it may be. With mild dehydration, your child may act thirsty and have a dry mouth. With moderate or severe dehydration you may notice fewer wet diapers, sunken eyes, a lack of tears when she cries, and listlessness. The first alternative to Phenergan for vomiting is to try out the home remedies you have at your disposal. Oral rehydration solutions can be purchased or made up at home and are a way to restore not only fluids but electrolytes in your child's body. You may wish to purchase Enfalyte, Pedialyte, or Gatorade, or instead make your own rehydration solution from ingredients in your kitchen. Not only are homemade solutions equivalent, but they are much cheaper and allow you to avoid the food dyes present in many store-bought solutions. One of the biggest mistakes in encouraging your child to drink fluids is to give too much too fast. It can be heart-breaking to limit your child's intake, especially if she appears very thirsty, but doing so is helpful if you hope to have the fluids "stay down." It's recommended that you begin by providing one teaspoon up to one tablespoon (three teaspoons) of an oral electrolyte solution every five to 10 minutes. The total amount of fluid your child will need depends on her degree of dehydration and can be estimated with a simple formula. As your child's nausea improves, and especially if she has diarrhea, you may wish to slowly introduce foods back into her diet. You can give foods like bread, potatoes, or rice along with lean meat, yogurt, fruits, and vegetables. Avoid foods high in fat as they are harder to digest. If your child also has diarrhea, the BRAT diet (bananas, rice, applesauce, toast) may help firm the stool, but it doesn't have enough nutrients to be used for any length of time. If an antiemetic medication is necessary, there are now many alternatives. One of the most commonly used alternative medications for children is Zofran (ondansetron.) Zofran is approved for the treatment of chemotherapy-induced nausea and vomiting but is often used "off-label" for treating the "stomach flu," medically known as acute gastroenteritis in children. When used for children with the stomach flu, Zofran has been found to reduce the chance that a child will need intravenous fluids (hospitalization). Zofran can be used even in younger children for who Phenergan is not recommended. Zofran comes with a warning as well (it can prolong an interval called QT seen on an electrocardiogram) but this is with the much higher doses required for chemotherapy, not the doses used for stomach flu. The medication can also be quite expensive. It's important to call your doctor if you are concerned about your child's vomiting, no matter how mild or severe it appears to be. Trust your gut as a parent. If your child is vomiting and goes without drinking any fluid for more than a few hours, call your doctor. Green-tinged or blood-tinged vomit, as well as any blood in her stool, is another reason to call right away. Abdominal pain is yet another reason to seek medical care, even if it comes and goes and is not constant. Learning about the warnings for the use of Phenergan in children is frightening as a parent, but there are plenty of alternatives that do not carry the same risks. The benefit of any medication needs to be weighed against potential risks. If your child is able to tolerate oral rehydration solution and is only mildly dehydrated, these home remedies can be very effective at preventing dehydration until the virus passes. Fedorowicz Z, Jagannath VA, Carter B. Antiemetics for reducing vomiting related to acute gastroenteritis in children and adolescents. Cochrane Database of Systematic Reviews. July 2011. doi:10.1002/14651858.cd005506.pub5. Lorenzo C. Patient education: Nausea and vomiting in infants and children (Beyond the Basics). UpToDate. Updated 05/02/17. Tomasik E, Ziolkowski E, Kolodziej M, Szajewska H. Systematic Review with Meta-Analysis: Ondansetron for Vomiting in Children with Acute Gastroenteritis. Alimentary Pharmacology and Therapeutics. 2016. 44(5):438-46.